The return of Jerami Grant from his back injury gave the Syracuse offensive the adrenaline shot it needed. SU’s victory over Florida State marked the first time in seven games the Orange managed to score more than one point per possession. But as the SU offense looks to return to form entering the post season, there is another key ingredient to success. I’m not talking about Trevor Cooney finding his shooting stroke (although that would help more than anything). I’m talking about giving the ball to Rakeem Christmas. Christmas has been an enigma during his SU career. At times, he’s showed flashes of brilliance, at others he’s seemed to disappear. But despite the lack of consistency, there’s a lot to like about Christmas on the offensive end of the floor. 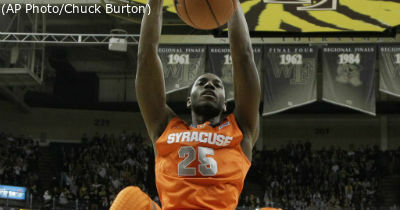 » Related: How will Grant’s return affect Syracuse? He ranks 30th in the country in offensive rating, scoring 1.27 points per individual possession – by far the most of any SU player. According to the advanced stats of sports-reference.com, Christmas is second on the team to Jerami Grant in win shares per 40 minutes – a measure of individual contributions to team success per minute on the court. But despite these gaudy statistics, Christmas only takes 11.6 percent of shots when he’s in the game and is used on just 13.6 percent of possessions. For comparison, CJ Fair leads the team by taking 28.9 percent of shots with usage on 26.4 percent of possessions. Boeheim had a right to be mad. Christmas had shot just 1-6 against the Eagles’ undersized front line, and he missed a 3-foot hook shot that would have won the game in regulation. But despite being on the wrong end of several tough rolls, Christmas was actually Syracuse’s most efficient offensive player against BC. He scored 1.02 points per individual possession, primarily by shooting 7-10 at the foul line. Fair led the Orange in points with 20, but only scored 0.9 points per individual possession. The problem wasn’t that Christmas was non-existent – it was that he was non-existent to his teammates. At half time, Christmas had taken just two shots. By the end of the game, half of his total shots came from offensive rebounds. Stop me if you’ve heard this before. Syracuse starts a game by posting up Christmas under the basket. 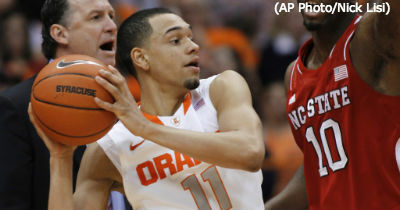 Tyler Ennis lobs the ball over Christmas’s defender leading to an easy dunk. The Syracuse doesn’t look to Christmas in the post for the rest of the game. This same scenario has played out multiple times this year. One could argue that Christmas doesn’t work hard enough to get open or that his relatively high turnover percentage (14.5 percent) dissuades the guards from looking his way. But these are reasons to work on getting him the ball in better position, not ignore him completely. The fact is that Christmas has the highest true shooting percentage on the team by nearly 10 percent – even higher than Arinze Onuaku in 2010. Disregarding his ridiculous 76.1% field goal percentage at the rim, he still shoots 41.9 percent on 2-point jumpers – better than Fair’s 41.0 percent. He also shoots better at the free throw line than CJ Fair or Jerami Grant but takes fewer than two per game. Christmas needs to get the ball more, and he needs to try to score more. Even if his efficiency declined by 10 percent with higher usage, he would still be one of SU’s most efficient scoring threats. Christmas is never going to be the focus of Syracuse’s offense. But a return to the usage rates of Onuaku and Fab Melo would be all that is needed to give SU’s offense an extra kick. Melo took 4 percent more of the team’s shots than Christmas does, while Onuaku shot more than 10 percent more. 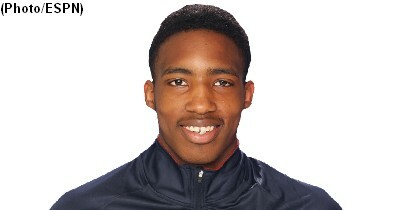 By featuring Christmas more in the offense, Syracuse will not only take advantage of his efficient shooting, the team will also benefit from his drawing more defensive attention. He would create more space for his teammates and help everyone to play better. This small change could help the Orange tremendously in the tournament. It does not rely on a player getting hot. It simply takes a change in strategy.